In regard to my reading habits of late, I am behaving much as I did during the months when my husband was sick unto death. It must be that the challenging remodeling project, combined with the physical disorder in several rooms, are taking all my resources to deal with it all, and making me hungry for literary comfort food. It’s hard to predict what I will be able to attend to, as I am impatient and flighty. The rare poem, or children’s stories of the deep and primal sort — those seem to be the best right now. In the high school class that I help teach at church, we are are still working our way through C.S. Lewis’s The Great Divorce, in which story George MacDonald has a part, being as he was greatly responsible for Lewis coming to faith. 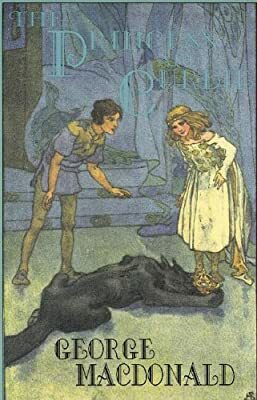 That got us talking about MacDonald’s books, and I was reminded of The Princess and Curdie, which I hadn’t read for a long time. I brought it into my “book larder” almost as soon as I got home on Sunday, and have been taking that nourishment. A quote from writer Mary Karr that I read today seems pertinent: “Memorize poetry & short prose hunks. This makes language eucharistic: you eat it. You take somebody else’s passion & suffering into your body, and it transforms you.” I found this to be the case a few years ago as I read MacDonald’s Phantastes at my cabin. When I read the words that Curdie heard Princess Irene sing, before I had run across Carr’s advice, I had immediately thought that I should learn them by heart, to be part of a laid-up treasure to draw from. For the time when the sleepers shall rise. For the day when the sleepers shall rise. The larks and the glimmers and flows! And the something that nobody knows!